I used to have students who would say to me, “I’m a writer, but I hate to read.” Whenever I’d hear that—and I heard it too much—I’d always want to do one of those obnoxious cough talks, where you hold your hand over your mouth, bark a cough, and simultaneously say something rude. But I was a good teacher, so instead I’d suggest a book I was sure would capture their interest. You can’t write and not read. I mean, I suppose you can, but I don’t really want to have to read what you write. And frankly, it seems a little rude to me to write something you think other people should read when you refuse to read yourself. I suppose you could be a chef who doesn’t like to eat anyone else’s food, but where would you get your inspiration and style? I have no idea if I would have thought of myself as a writer if my mother hadn’t made being a reader non-negotiable. Maybe I would have been like those old students of mine, enamored with the idea of having my name on a book or a story or a poem published with my byline without having bothered to study craft or let someone else’s words inspire my own. It’s one of those unanswerable nature vs. nurture debates. 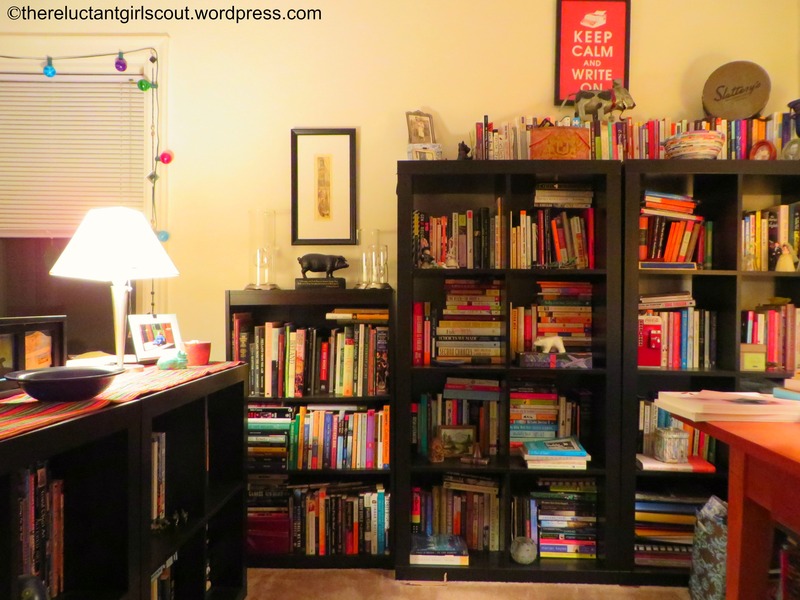 I grew up in an apartment that was filled, floor to ceiling, with books crammed into a brick-and-board shelving system. I saw my mother reading and I was read to nightly. I had my own library card the moment I was allowed to have one, and I knew how to use it. (Brief aside: one of the saddest losses to me in this barcode age is the absence of the satisfying “Ka-chunk” sound when you checked out a book.) My childhood was spent at garage sales, used bookstores, and in the book sale section of the musty Salvation Army store, where Mom’s early collection got its start. Though I might have gotten bored during these lengthy browsing sprees at times, I was resigned. Books were holy and when you were in the presence of some that were for sale, you kept quiet and waited for selections to be made and the ting of the cash register that signaled the benediction. I had my own bookcases before I had my own room. They were full of Little Golden Books, Dr. Seuss, the Little House on the Prairie Series, Trixie Belden mysteries, and all manner young adult books. The shelves grew. First three small ones, and then a desk set with adjoining shelves that were later cut in two, turned sideways, and had boards put across the short ends, giving my own library room to grow. When my mother and step-father got married and bought a house, it wasn’t long before we’d enlisted him into building floor-to-ceiling shelves in my bedroom. When I was constructing my library, my belief was that it was something I’d carry with me for life, like scars and family photos. You might weed out the baddies, but even if you outgrew a book, you didn’t casually release it into the wilds. You hung on to it because it was part of the literary canon of your life. When you think of me, I’d like for you to have the above photo in mind: my tidy desk with a row of writing books in front of me at the ready, should I need to find an answer about style or read a line for inspiration. These are all books that I’ve read in total or in part and know to be useful. 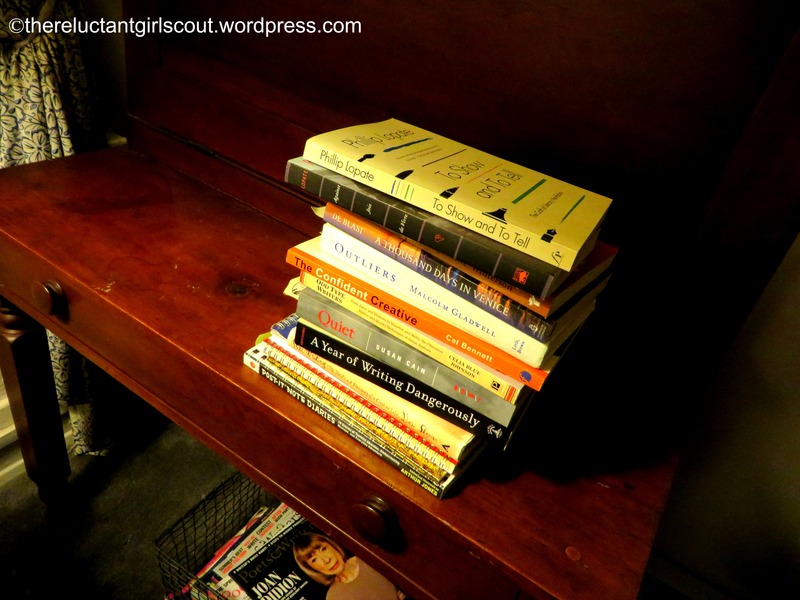 When I look at my desk, these books bring me joy because this is the sort of person I always imagined I’d be: organized, controlled, and like a good Girl Scout, prepared. But I’ve got a book problem. They multiply like rabbits. Despite the fact that I culled the herd when I moved here, and left half of my collection back in Indiana at my folks’ house, I’m operating at near maximum capacity here. When I was cleaning out my office this past spring after I resigned from my teaching position, I weeded extensively. There were a lot of books there that I had bought when I was just starting my collection, thinking that my life wouldn’t be complete if I hadn’t read the complete works of ________________________________, but two decades later I no longer felt compelled. I’m beginning to recognize that I don’t have an infinite amount of reading days ahead of me, and so I’m trying to be choosey. (Which begs the question, why was I up until four a.m. last night finishing the latest Dan Brown novel.) But even with the weeding, every time I’m back home, a few more books leap into my suitcase, desperate to be reunited with their siblings. So this is what my writing studio looks like, plus another set of shelves on the opposite wall where the books are double-stacked. Plus, a small set of cubes to go on top of these just as soon as Z and I figure out how to secure the shelves to the wall without wrecking our chances of getting our deposit back. There wasn’t room for bookshelves in our living room, so for the first year or so that we were married, it was largely book free, give or take a coffee table book. 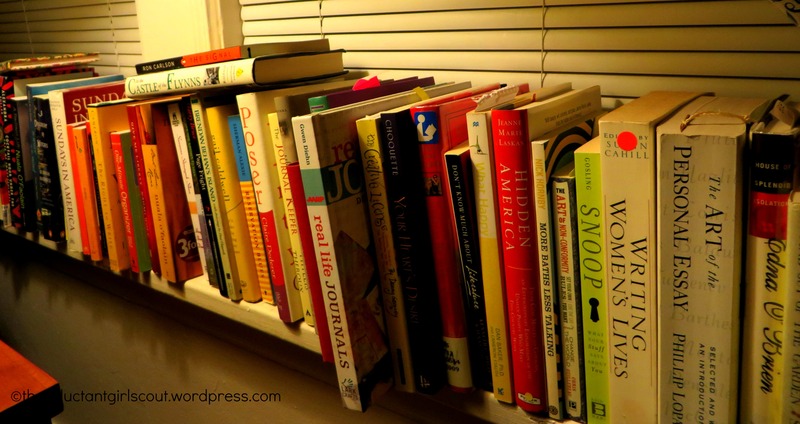 Then I started getting books that I was planning to read “next.” So I put them on the windowsill behind the sofa. At first, it was just a few books and I definitely would be getting to them shortly, but then I went to a bookstore, used up an Elliott Bay Books gift card, went to a reading and felt compelled to buy the author’s latest title, had a birthday, and the next thing I knew, my “next” collection ran the length of the double windowsill. While the books in my studio are arranged in a very specific but intuitive fashion so I can easily find what I need, on the windowsill it is a free-for-all. I put books there as they come to me, so race car driver Janet Guthrie’s biography is right next to National Geographic’s Scenic Highways and Seven Secrets of the Prolific. Books crept into the weird bar space behind our TV. Some appeared under my little wooden stool. 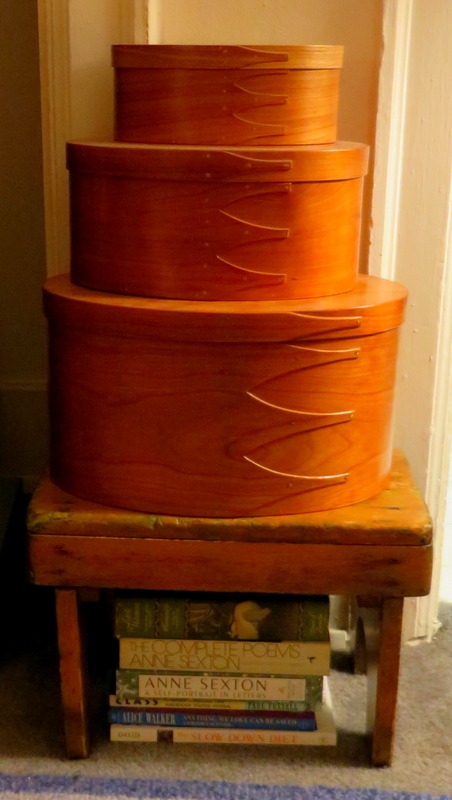 We won’t speak of my nightstand, where the stack is currently so high, it threatens to block out my light. Nor will we speak of Z’s poor books, which I always relegate to hidden corners and alcoves. Any of these books could go live in the studio, where they might be more at home and so I would have more surfaces in my living room on which to set Zimbabwean objet d’art (read: stone hippos and wart hogs made of scrap metal), but I know as soon as I take them there, they’ll be lost to me. I’ll forget about them, find them in ten years and wonder what made me ever think I wanted to read a memoir about a Seattle mom who loves yoga or an American family who lived in Berlin before World War II. And don’t even get me started on why it is I think I need to own every book about writing that was ever written. I’ve got so many books on how to be a productive writer, that I refuse to buy another unless the first line is: In order to be a more productive writer, quit reading books about how to be more productive. It’s a sickness I have. This is my most recent stack of books, compliments of Z and my folks. They came for both Christmas and my birthday. The desk behind them will open. Right now. But as soon as I cash in those holiday gift cards? Forget about it. So here’s my 2014 challenge to myself. 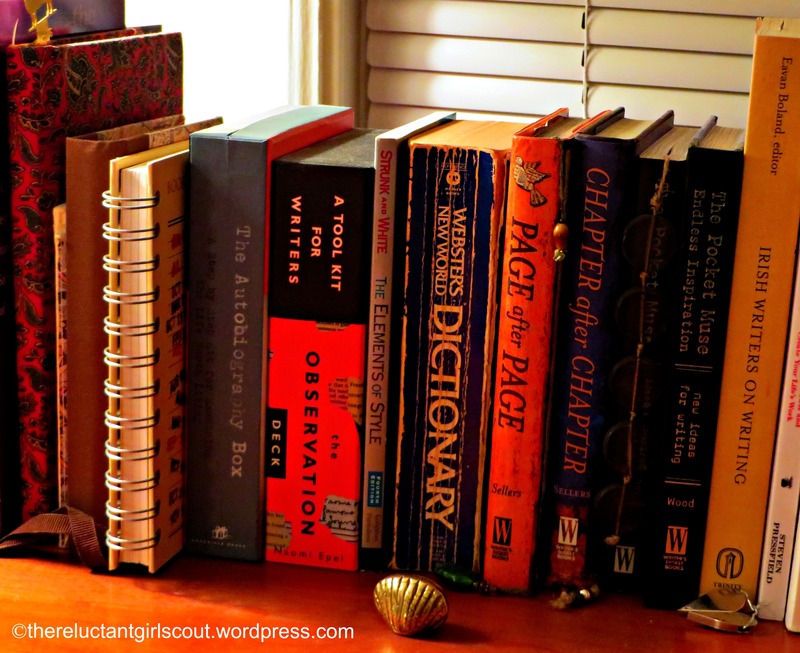 I am going to show up to those books on the windowsill (and my new books, of course!) read as many of them as I am able, and report back to you. If it were a real challenge, I’d make some outlandish promise about how they’d all be read and removed by December 31st, but I’m not crazy. Some books will probably always need to live there so I have easy access: The Art of the Personal Essay, The One-Minute Organizer, and You Can Heal Your Life (because sometimes I need to know what negative thought pattern I have that might be causing my big toe to hurt). That’s 68 books, plus the top two on my nightstand that I’ve got to finish, which rounds it off to a solid 70. And maybe, for good measure, I’ll read all the magazines I’ve been stockpiling since I got married. Joan Didion has been staring at me from the cover of Poets & Writers for two years now. What are you reading? Oh, don’t tell me. The windowsill is already full.